Does iOS Recording spell the end of Indies needing to use a studio? Meteor MultiTrack DAW for iPad[/caption]Mobile recording has come a long way in the last few years, not least with the uptake of the Apple iPad by Musicians. 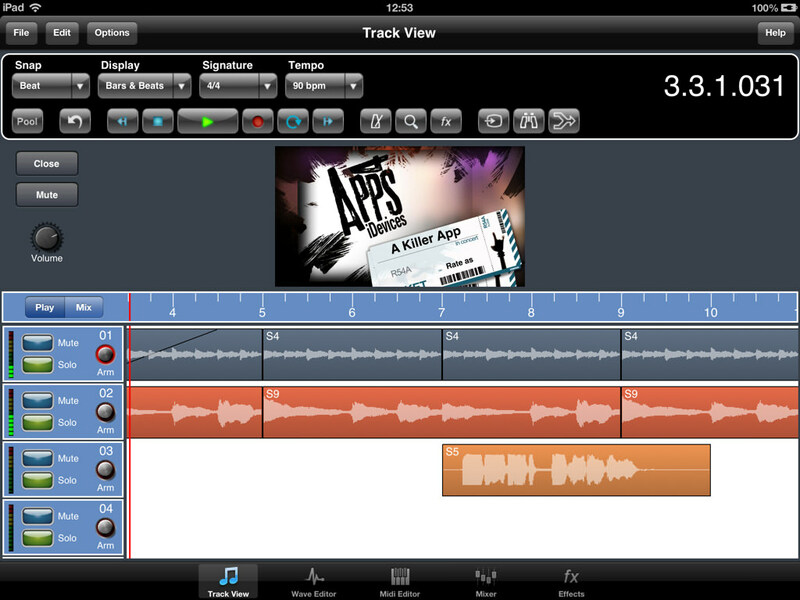 The range of music making apps available for the iPad give musicians an incredible music creation platform. But with the range of multitrack recording Apps now available do Indies still need to fork out for Studio time or do they simply record their tracks on an iPad? I know in countries like Brazil studio time is financially out of reach for most musicians and they have embraced mobile solutions to help get the music made but is this true in other countries. Meteor MultiTrack Recorder DAW for iPad has received a major update with the release of Version 1.6. Meteor which already hosts a range of impressive features including up to 24 tracks of CD Quality Recordings now also offers Simultaneous MultiTrack Recording plus a range of other great new functionality detailed below. Another great addition to its functionality is the ability to record a sound track for your video and export as one file so you can upload them to YouTube. Journalists can create their video reports on the go and email them to the ready to go. Selectable Inputs for both Audio Sources and AudioBus. Selectable Outputs for each track. The Video plugin now allows you to export a movie with soundtrack to a file or the camera roll. Stacked Recordings (Loop Mode in Single Track Mode). Added a Basic Auto Tune for monophonic vocal recordings to the wave editor. Added an Invert Phase option to the wave editor. Copy, Paste and Replicate now preserve cross fades. Added the ability to apply cross fades to all cloned clips. Added Cross Fade presets for 5, 10, 20, 50, 100 and 500ms. Added Share To dialog to Audio Pool. Added Markers for easier project navigation. Added MIDI Track Event Inspector. Added the ability to Dissolve Type 0 MIDI files and MIDI Parts. Added the ability to Dissolve MIDI parts by Channel, Note, CC type or Selection. Fixed a bug when sending a Mix Down via Email. The Overview button now displays a preview of an entire track in the MIDI Editor and the entire mixer in Mixer Mode. Added a New project option to the Project Explorer. Added the Song name to the Overview screen. Added an Info option to Track Mode for displaying track names and types. Added a ‘Mixer Control Method’ option to the ‘Options’ menu. 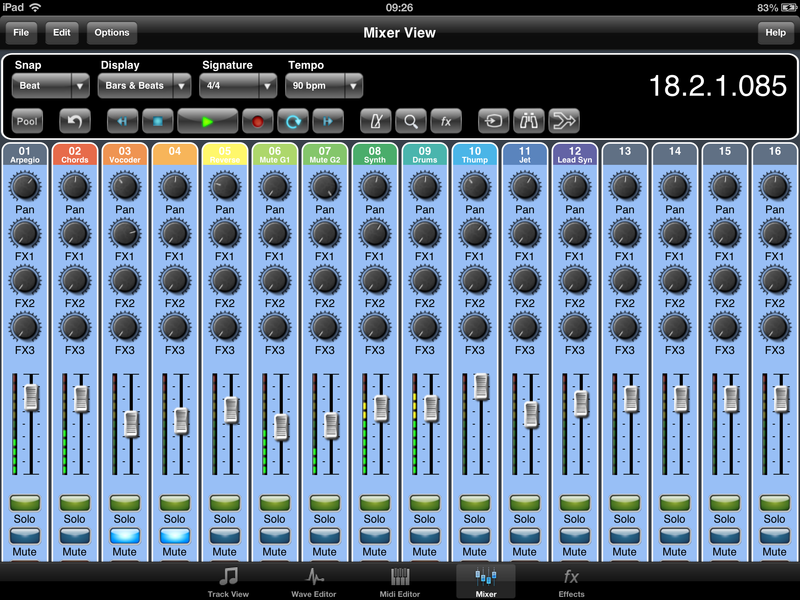 This allows you to select a prefer method of control in the mixer. Added a scroll lock to the mixer view. Added an option to the iPad’s Settings app which allows you to turn off the automatic loading of the last loaded project. Q2. You’re a multi-talented Guitarist/Singer/Composer, is there a particular aspect you prefer? I started getting interested in music as a acoustic guitarist at 14, but at 18 I had to learn to play bass because I joined a band that needed a bass player, I continued to play bass for many years, and went back to playing guitar 7 years ago. Right now I’m in love with guitar. The first reason was that at the time of the band in ’95, we did not record the job decently, just made records on cassette tapes. Another reason was also that the band no longer exists and some former members no longer work as musicians, so there was no possibility would be all together again, each took different paths in life. The band was independent at the time and had no access to good studios. I always liked those songs and felt sorry for not having done a good recording of them. When I bought the iPad 2 years ago, I noticed that when recording electric guitar I got an excellent result, and it reminded me of the work of Pajama’s, I had to ask for help to remember the lyrics and started to record a couple of tracks before I knew it I was recording 14 songs. I’ve always been interested in using portable recorders, I already had several studios port (tascam, yamaha), drum machines, sequencers. When I saw the iPad I started doing small tests in Garageband was impressed and so I bought the IPad. I used the Apogee Jam, and soon I learned how it worked and I realized I was getting better guitar sounds than in several professional studios I’ve ever had recorded in. Soon I noticed that the GarageBand would not be enough and that I needed a more professional app and found Meteor, then yes I was really excited to do all the work. I recorded the harmonization’s and sometimes sang 2 to 3 times each harmonization to get that wall of sound, like Queen and Beatles on the songs Right on, Sun is on the way. The verse of In the Evening and chorus of I’m Addicted, was sung by the musician and song writer Toninho Mattos. I think the whole world is using IPad to record, but maybe it’s a success in Brazil because a good studio here is very expensive and one of medium size sometimes you do not get good results. Actually I do not know how iTunes works for independent band, I need to tell you how this really works, in Brazil, the people still do not have much in the habit of using iTunes, the people still downloads the net. But I think it would be great if I could put my songs out, but at the same time, because the band to be independent, I do not know if people would know that the band is available on iTunes, I will get better informed and see. When I recorded this work I was not really planning on selling it, it was just to record it and show it to friends, but would not be so bad if I could make some money with it. Q9. What’s does 2013 hold for you, can you tell us what are you plans are? Yellow belly custard, green snot pie. All mixed together with a dead dogs eye. Slap it on a butty nice and thick. Then wash it down with a cup of cold sick. I then added more lyrics, and using Meteor Daw from 4PocketsAudio on the iPad, I eventually recorded a song similar to ‘I Got 5 on it’ by Da Luniz, to accompany the vile lyrics. A vulgar rap song similar to YFM (Your Favorite Martian), Epic Rap Battles (ERB), Lonely Island, Nice Peter, Macklemore and Flight of the Conchords. The Pajama Flowers Band was formed in the early ’90s in Taubaté-SP (Brazil) by Guilherme Freitas, Marcelo Neves and Toninho Mattos, and when they toured the U.S. Marcio Chaves and Eduardo Indian had joined the band. Pajama Flowers Finished 97 but have regrouped to re-record the the greatest hits. The material was all recorded at home studio Guilherme Freitas. Eletric Guitars: Gibson SG Standard, Prs Custom 22, Suhr S3 , plus fender strat.